McCarthy, M., Tiliakos, N., Modi, V., Fréchette L.G., “Thermal Buckling of Eccentric Microfabricated Nickel Beams as Temperature Regulated Nonlinear Actuators for Flow Control”, accepted in Sens. & Actuators A, 2006. McCarthy, M., Tiliakos, N., Modi, V., Fréchette L.G., “Temperature Regulated Nonlinear Microvalves for Self-Adaptive MEMS Cooling”, Proc. 2006 Solid State Sensor, Actuator, and Microsystem Workshop, Hilton Head Island, SC, June 4-8 2006. Lee, C., Liamini, M., Fréchette L.G., “Design, Fabrication, and Characterization of a Microturbopump for a Rankine Cycle Micro Power Generator”, Proc. 2006 Solid State Sensor, Actuator, and Microsystem Workshop, Hilton Head Island, SC, June 4-8 2006. Fréchette, L.G., Wong, C. W., Chin, K., Farmer, K. F. Miller, F., Modi, V., “Hands-On MEMS: Building Competence Through Practical Learning Experiences”, Educational Proc. of the 2006 Solid State Sensor, Actuator, and Microsystem Workshop, Hilton Head Island, SC, June 4-8 2006. Modroukas, D., Modi, V., and Fréchette, L.G., “Micromachined Silicon Structures for Free-Convection PEM Fuel Cells”. J. of Micromechanics and Microengineering, Vol. 15, pp. 193-201, 2005. Nagle, S.F., Livermore, C., Fréchette, L.G., Ghodssi, R., Lang, J.H., “A Micro-Scale Electric Induction Motor”. J. Microelectromechanical Systems, Vol. 14, No. 4, 2005. Fréchette, L.G., Jacobson, S. A., Breuer, K. S., Ehrich, F.F., Ghodssi, R., Khanna, R., Wong, C.W., Zhang, X., Schmidt, M.A., Epstein, A.H., "High-Speed Microfabricated Silicon Turbomachinery and Fluid Film Bearings". J. Microelectromechanical Systems, Vol. 14, No.1, 2005. Lee, C., Fréchette, L.G., “Demonstration And Characterization Of A Multi-Stage Silicon Microturbine”, Proc. ASME Int’l Mech. Eng. Congress & Expo., Paper IMECE2005-81435, Orlando, FL, Nov. 5-11, 2005. McCarthy, M., Tiliakos, N., Modi, V., Fréchette, L.G., “Characterization And Modeling Of Thermal Buckling In Eccentrically Loaded Microfabricated Nickel Beams For Adaptive Cooling”, Proc. ASME Int’l Mech. Eng. Congress & Expo., Paper IMECE2005-81415, Orlando, FL, Nov. 5-11, 2005. Modroukas, D., Modi, V., Fréchette, L.G., “Micromachined Silicon Structures for Free Convection PEM Fuel Cell Power Sources”, Proc. 4th Int’l Workshop on Micro and Nano Technology for Power Generation and Energy Conversion Applications (PowerMEMS ’04), Kyoto, Japan, pp. 154-157, Nov. 28-30, 2004. McGee O.G., Graf, M.B., Fréchette, L.G., "Tailored Structural Design and Aeromechanical Control of Axial Compressor Stall - Part I: Models and Metrics". ASME J. of Turbomachinery, Vol. 126, No. 1, pp.52-62, January 2004. Fréchette, L.G., McGee O.G., Graf, M.B., "Tailored Structural Design and Aeromechanical Control of Axial Compressor Stall - Part II: Evaluation of Approaches". ASME J. of Turbomachinery, Vol. 126, No. 1, pp.63-72, January 2004. Hong, S., Thiffeault, J.-L., Fréchette, L.G., Modi, V., “Numerical study of mixing in microchannels with patterned zeta potential surfaces”, Proc. ASME Int’l Mech. Eng. Congress and Expo. (IMECE’03), Washington, D.C., Nov. 16-21, 2003. Breuer, K.S., Ehrich, F.F., Fréchette, L.G., Jacobson S.A., Lin, C-C, Orr, D.J., Piekos, E.S., Savoulides, N., Wong, C-W. "Challenges for High-Speed Lubrication in MEMS" NanoTribology. Ed. S Hsu. Kluwer Press, 2002. Zhe, J., Wu, X., Cheng, J., Wang, J., Farmer, K.R., Fréchette, L.G., and Modi, V., "Analytical Pull-in Study on Non Deformable Electrostatic Micro Actuators". Proc. 5th Int’l Conf. on Modeling and Simulation of Microsystems (MSM2002), San Juan, Puerto Rico, April 2002. Cheng, J., Zhe, J., Wu, X., Farmer, K.R., Modi, V., and Fréchette, L. G., "Analytical and FEM Simulation Pull-in Study on Deformable Electrostatic Micro Actuators". Proc. 5th Int’l Conf. on Modeling & Simu. of Microsystems (MSM2002), San Juan, Puerto Rico, April 2002. Fréchette, L.G., "Assesment of Viscous Flows in High Speed Micro Rotating Machinery for Energy Conversion Applications". Proceedings of the 2001 ASME International Mechanical Engineering Congress and Exposition (IMECE'01) - MEMS subdivision, New York NY, Nov. 2001. 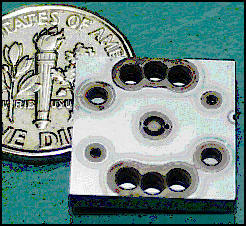 Fréchette, L.G., Development of a Microfabricated Silicon Motor-Driven Compression System. Ph.D. Thesis, Massachusetts Institute of Technology, Cambridge, MA, August 2000. PDF file: print resolution (5.8 Mb), screen resolution (2.9 Mb). Send mail to Luc.Frechette@USherbrooke.ca with questions or comments about this web site.